Well, we have certainly lived up to our name. Since we left the dock in Victoria in mid May, we have travelled almost 8,000 kms. That’s a lot of water passing under our keels. So it’s not too surprising that we have been very happy to just stay put in Banderas Bay for the past couple weeks. But….we have not been idle…. 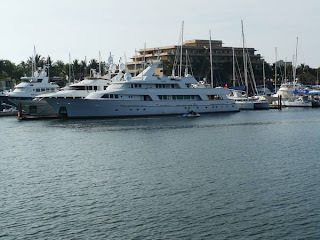 La Cruz – the favoured anchorage in Banderas Bay. We have spent a number of nights here and although it can be little bumpy and the water is a little murky, it’s been fun. The Sunday Market is fabulous, with the best tamales we’ve ever had, and the fish market is amazing. Kathy and Anja can be seen swimming from boat to boat in the anchorage most days during their 3 pm exercise hour. Paradise Village – in Nuevo Vallarta, is an incredible marina connected to a 5 star resort with 4 pools, shopping mall, Starbucks, ping pong tables…you name it, they got it. As its nickname (the Velvet Prison) suggests, once you arrive it’s hard to leave and we’ve spent too many very comfortable days here. Unfortunately, as it always is when you tie up to a dock, there have been lots of chores to do as well as relaxing by the pool and drinking banana daiquiris. 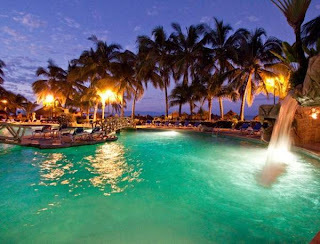 Nuevo Vallarta – home of Walmart…..cheap groceries, wine and cervezas. Need I say more? Sayulita – the quaintest little village we have found in Mexico thus far and Bryn and Tanner’s home away from home. We missed the bus getting there and accepted a ride from a random Mexican (completely ignoring the “never get into a stranger’s car” rule) who turned out to be a very nice policeman (thank goodness) whose wife is a Canadian. Small world. Being taken out for lunch at Fish Tacos was a real treat….thanks Bryn and Tanner. Tres Marietas – we took Bryn and Lea, Tanner and his family (Nancy, Lyle and Brianne) and friend, Louis, out to Tres Marietas, 3 small islands a couple hours NW of La Cruz. Snorkeling, kayaking, and beachcombing were excellent despite the fact that a number of the crew were feeling under the weather (from a bumpy ride or too much “fun” the night before?). Visited by whales and dolphins, much to everyone’s delight, and had a great sail back. Beaching Vakasa to install a new depth sounder was a scary but exciting adventure. There’s just something wrong about driving your boat up onto the sand, but we took advantage of a 4 ft tide and grounded the boat for almost 24 hrs so Tony could cut a hole in the hull and insert a new sensor. At the same time, we cleaned the hulls and props, scraped off some barnacles that were freeloading on the hull, and did some waxing on….waxing off. Freakiest part was listening to Vakasa groan and moan as she slowly pulled her keels out of the sand as the morning high tide lifted her. The arrival of a very tired but happy Lea was definitely a high. After a 21 hour flight itinerary with an 8 hour layover in Houston - where she got zero sleep because the fire alarm was going off every 20 mins - she was collected at the PV airport no worse for the wear. It’s so great to have her onboard and to catch up. She even brought us a Christmas tree! Sun rising.....we don't see that very often! 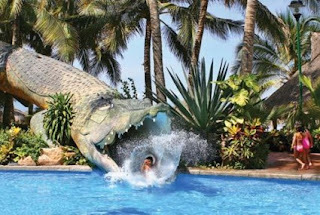 Gotta love the crocodile slide! I'm going snorkeling......but I really don't like fish! How come she gets to just lie around when there's so much work to be done? There is still lots to do in Banderas Bay and we’ll be here until the first week of January and Lea’s departure for home. We wish everyone the very best this Christmas Season. Feliz Navidad! Great to read about your adventure. Thought I would tell you that I finally got my watermaker running and thank you again for stopping by the boat in San Diego. We are now in Barra de Navidad, in the marina, for Christmas, New Year's, etc. Hope to meet up again in the future.